Each year St. Paul's partners with various local ministries throughout Cedar Rapids, our Iowa United Methodist connection, and even our international United Methodist connection. The most visible way we partner with these missions is through our mission partner offerings throughout the year, but St. Paul’s members also serve at some of the local missions. We are beginning to develop deeper relationships with other mission partners we know, trust, and support. Helping Hands provides emergency material assistance, referrals, and supportive ministry to persons in emergency need in collaboration with local agencies and faith communities in Linn County. See wish list on Helping Hands website. Learn more about Helping Hands. Primary way of support is through the offering at St. Paul's UMC. Learn more about Human Relations Day. Disabilities Awareness This offering exists to celebrate the gifts and graces of individuals with disabilities and to promote their full inclusion in the community. Money received from the offering will fund educational opportunities in Iowa as well as assist churches in making their facilities more accessible. Mission of Hope provides free meals, shelter, worship services, food pantry, jail ministry, emergency clothing, and spiritual growth/support. See current needs list and volunteer opportunities on Mission of Hope website. Learn More about Mission of Hope. Neighborhood Meals For twenty-eight years, the Neighborhood Meal and Enrichment Program (NMEP) has provided free warm, nutritious meals for the Wellington Heights, Mound View, and Oak Hill and other neighborhood children and their families during the summer months. 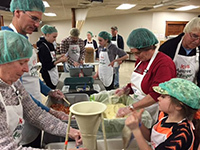 Noon meals are prepared and served at St. Paul’s United Methodist Church with sponsorship and support of six community churches: Christ Episcopal, First Lutheran, First Presbyterian, Grace Episcopal, St. Paul's United Methodist, and Westminster Presbyterian. The meal is followed by the SPRINT enrichment program for children. Help us continue to serve those in our community who need a midday meal. Donations can also be made by cash or check and mailed or delivered to the church office. To donate food, contact NMEP director Joanne Kriz. Learn more about Neighborhood Meals. One Great Hour of Sharing is an effort to empower, proved water, supply food, and give relief from disasters. Primary way of support is through the offering. Learn more about One Great Hour of Sharing. Inter-Religious Council of Linn County The IRCLC was formed in 1993 to encourage understanding, respect, and friendship among individuals of different faith traditions in Linn County. Easter Offering Each year, Sending to Serve and the Church Council designate a special mission effort for focus. This offering is then matched up to $12,000 to go toward Iowa Annual Conference apportionments. St. Paul's website, look for details in March/April. Ingathering Kits provides school supplies and basic health supplies to send around the world. See website for detailed list of kit supplies. Provide items (typically in summer/fall), help assemble kits in October, or join a team to help deliver kits to Louisiana to be prepped to send into the world. Learn more about Ingathering Kits. His Hands Free Clinic provides free medical, chiropractic, women's health, mental health, physical therapy and dental services in the Wellington Heights neighborhood. Seeking medical volunteers, social work volunteers, administrative/clerical, and prayer support for patients. 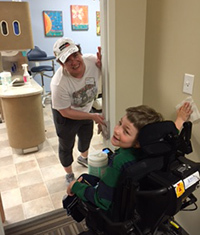 St. Paul's get involved with the May IMM to do light maintenance work for the clinic. Learn More about His Hands Free Clinic. Peace with Justice enables The United Methodist Church to have a voice in advocating for peace and justice through a broad spectrum of global programs. Learn More about Peace with Justice. Matthew 25 revitalizes communities, creates a healthy food culture, and mentoring youth. Volunteer by being a book buddy, staff Groundswell event, garden with children, create a team for neighborhood building work, support the tool library, work at the urban farm. Women at the Well is The United Methodist Church that meets inside the walls of the Iowa Correctional Institution for Women in Mitchellville. Not only does Women at the Well offer hope and support to the women while they are at Mitchellville, but they also coordinate reentry teams to provide support as women leave the prison. Learn more about Women at the Well. Neighborhood Emergency Fund offers small amounts of assistnace in the form of vouchers, bus passes, or bill assistance to individuals in desperate need. Listen, pray, and offer care to individuals with significant needs; and awareness of various community assistance programs is also helpful, but not necessary. Contact Pastor Jonathan for more information. St. Paul's African Nationals Emergency Fund is a ministry with and to African Nationals members of St. Paul's. Volunteers are needed for tutoring, transportation, and preparing individuals for citizenship examinations. Learn More about African Nationals. World Communion provides scholarships for U.S. racial- and ethnic-minority students and international students, on both undergraduate and graduate levels. Learn More about World Communion. Family Promise help homeless and low-income local families achieve sustainable independence. 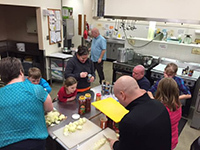 Cooking and serving meals, playing with children or helping them with homework, and staying overnight when families stay at ST. Paul's for a week, a few times a year. Beyond providing lodging and meals, volunteers interact with the guests, treating them with respect and responding with compassion. Linn Community Food Bank provides a 3 day emergency supply of food to families in need. Seeking a wide variety of donations of food and volunteers to sort donations. Learn More about Linn Community Food Bank. St. Paul's SPRINT provides a free nutritious lunch, as part of the Neighborhood Meals and Enrichment Program (NMEP), followed by free educationally-based activities and special field trips. Volunteers as readers, music assistance, knitters, fitness assistnats and chess teachers. St. Paul's Christmas Eve Day Dinner offers a free Community Christmas Eve Day Dinner for those in need and those who prefer not to spend Christmas day alone. Volunteers needed to prepare food, serve the dinner, and provide transportation, or donations of needed food items. Learn More about St. Paul's Christmas Eve Day Dinner. Christmas Offering TBD - changes annually. St. Paul's website, look for details in November/December. For more information on special offerings and our mission partners, talk with Pastor Jonathan Heifner at 319-363-2058 or jheifner@stpaulsumc.org. Helped with light maintenance and painting at His Hands Free Medical Clinic. 6000 dehydrated meals packed that will feed hungry people all over the world! Cooked chili for dinner with neighbors, froze leftovers to give out as needed, and assembled welcome baskets for Meade Flats.